The following paragraph and photo were published in the Waukesha Freeman, Waukesha, Wisconsin, Thursday, May 30, 1895, Page 4. "The subject of this sketch was born in the city of New York. January 15, 1838. With his parents (Edwin and Ann Eliza Townsend) he came to Wisconsin in the fall of the year 1840, locating in Milwaukee. He attended the schools of his adopted city and later graduated with honors from Racine College. After finishing his college course he entered the Forest City Bank, Waukesha and became cashier of that institution. In the year 1860 he married Mary Ella, sister of Col. Sidney A. Bean (who lost his life in the late rebellion) and Capt. Irving M. Bean. now a resident of Milwaukee. Capt. Townsend enlisted and was very active in raising the 28th Wisconsin Volunteers was elected Captain of Company B and went into active service in that capacity." "His Lieutenants were Cushman K. Davis (now United States Senator from Minnesota) and Charles B. Slawson. His active duties were performed in the state of Arkansas where he met his untimely death, while carrying important dispatches for his government, April 25th, 1864. His remains are at rest in the beautiful National Cemetery at Little Rock, Arkansas." During the Camden Expedition, Capt. 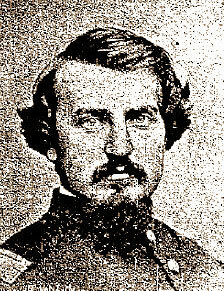 Townsend was killed in an engagement with Confederate forces near Marks Mills, Arkansas on April 25, 1864. For more information about his service, see the Mandeville Townsend Web page maintained by his descendant, Linda Hendley.